Demand Controlled Ventilation is usually included with comfort control and the control of general building functions under the banner of ‘Building Management Systems’ or BMS. The idea being that the system will optimise conditions and minimise energy waste. However, many air handling products are supplied with controls that are considered redundant by the BMS installer who then fits his own additional (sometimes inferior) sensor. Whilst BMS is good at overall management, in my experience they are not the best way to control ventilation systems. What’s the ideal demand controlled ventilation system? closing to a minimum in high summer when cooling is required. To do this you would need ducting and fans sized for higher flows than are currently specified and a good control system based on high quality CO2 sensors. EC fan motors only consume small amounts of energy when running at low speed and they have a longer service life than other types. Ducts capable of changing the air 10 or even 20 times the room volumes every hour would be ideal, however some existing designs can only provide a third of this. The result is often to turn on the cooling/air conditioning when its 18ºc outdoors which defeats the purpose of saving energy. In practise, the extra cost of ducting and large heat recovery air handling units would be quite high. a separate supply and extract air handling units with extra ducting as necessary. CO2 Sensor offers reliable constant pressure solutions. 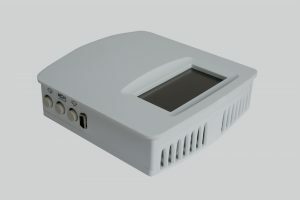 Neatafan uses the latest CO2 sensors which can proportion the airflow via fan speed to meet a set point of say 500-800 ppm (CO2 content in parts per million), as well as simple systems which use on/off (PIR) or two fan speeds. Each room has motorised supply & extract shut off dampers. These are switched by a CO2 sensor in the room to open in response to occupancy. The change in overall pressure is small in the main extract duct but it can be detected by the pressure sensor local to the main fan and the air volume increased to match the demand without any wires between the two locations. At Neatafan, we have tested many sensors and can offer a reliable constant pressure solution. 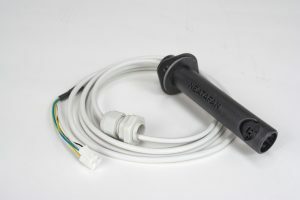 DTFS Air Velocity Sensor – can detect very low velocities and variations in velocity. Rather a lot of emphasis is put on air volume measurement during commissioning when perhaps more time should be spent ensuring air flows where it is intended. By reducing the average airflow rate, demand controlled ventilation systems can minimise energy waste. The pressures involved are quite small, but now we have more sensitive sensors available, the opportunity to measure differences between rooms has led to a clearer understanding. Neatafan has vast experience in demand controlled ventilation – contact us to discuss your specific needs on 01489 783 783 or visit neatafan.co.uk for more information on our products.